• Untold stories of suffragettes are uncovered in a new display at the Museum of London marking the centenary of women’s suffrage. Votes for Women tells the story of the likes of Emily ‘Kitty’ Willoughby Marshall – arrested six times and imprisoned three times in Holloway including once for throwing a potato at the resident of then-Home Secretary Winston Churchill, Winefride Mary Rix – sentenced to two months hard labour for smashing a window at the War Office, and Janie Terrero – a suffragist since the age of 18 who was imprisoned in Holloway for four months for window smashing during which time she twice went on a hunger strike and was force-fed. The objects on display include Emmeline Pankhurst’s iconic hunger strike medal, a pendant presented to suffragette Louise Eates on her release from prison, and a silver necklace commemorating Willoughby Marshall’s three prison terms. There’s also a newly commissioned film installation highlighting the individual commitment and courage of the lesser known suffragette women. The exhibition opens tomorrow and there’s a special family-friendly festival this weekend featuring interactive performances, workshops and special events. The exhibition Votes for Women runs until 6th January next year. For more, including the full programme of events, see www.museumoflondon.org.uk. • The golden age of ocean liners is recreated in a new exhibition opening at the V&A this Saturday. Ocean Liners: Speed & Style showcases more than 250 objects with highlights including a Cartier tiara recovered from the doomed Lusitania in 1915, a panel fragment from the Titanic‘s first class lounge, Goyard luggage owned by the Duke of Windsor dating from the 1940s, and Stanley Spencer’s painting The Riveters from his 1941 series Shipbuilding on the Clyde. Other artists, architects and designers whose work is featured in the display include Le Corbusier, Albert Gleizes, Charles Demuth and Eileen Gary. Among the “design stories” explored in the exhibition is that of Brunel’s Great Eastern along with Kronprinz Wilhelm, Titanic and its sister ship Olympic (all known for their Beaux-Arts interiors), the Art Deco Queen Mary, Normandie and the Modernist SS United States and QE2. The display also features objects related to some of the ocean liner’s most famous passengers as well as the couturiers who saw ocean travel as a means of promoting their designs. These include a Christian Dior suit worn by Marlene Dietrich as she arrived in new York aboard the Queen Mary in 1950, a Lucien Lelong gown worn for the maiden voyage of the Normandie in 1935, and Jeanne Lanvin’s Salambo dress, which, as one of the most important flapper dresses in the V&A collection, once belonged to wealthy American Emilie Grigsby who regularly travelled between the UK and New York aboard the Aquitania, Olympic and Lusitania in the 1910s and 1920s. Runs until 10th June. Admission charge applies. For more, see www.vam.ac.uk/oceanliners. 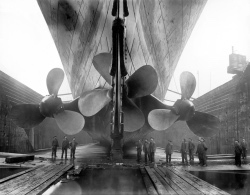 PICTURE: Titanic in dry dock, c1911, Getty_Images (Courtesy Victoria & Albert Museum).